Send this delightful freshly baked treat as a gift or just because. Perfect for special occassions, birthdays and more. Cookies are 3inches x 3inches. 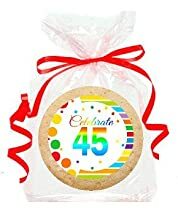 Cookies are individually wrapped with color cordinated strings. They also come gift packaged in a clear gift basket cello bag with a matching ribbon. Images used on the cookies are licensed images. Cookies are gift ready. They can be used individually as party favors or collectively as a center piece or for decorating your tables. Cookies are baked in our bakery. To Ensure freshness please order exactly 5business days prior to your event.